Home Articles Will Anyone Follow Dean Ambrose out the Door? Hello everyone. Today, I’d like to talk about talents who could find Dean Ambrose’s departure a motivating factor in leaving WWE, in the hope they will prosper elsewhere. Before we go in to them, let’s talk about the man who may forever split The Shield when he leaves WWE following Wrestlemania 35. The Lunatic Fringe is a funny character. Originally compared to Mick Foley, Steve Austin, Brian Pillman and Roddy Piper, it’s safe to say he was rough around the edges. He had “attitude”, and many believed he could grow in to a tough, no-nonsense badass. And he initially came across well, holding the United States title hostage as one-third of The Shield. After turning face with his brothers, he remained the same, unpredictable guy who could do anything at any moment. Something happened after The Shield split though, and it wasn’t to the betterment of his long-term prospects. What exactly is the The Lunatic Fringe? I assume it’s like .. Pillman pulling a gun on someone? It’s like Nikki Cross getting excited to play? Perhaps it’s Alicia Fox’s childish acts? When we compare to them, I think it’s hard to say the nickname accurately describes Dean Ambrose. He never fit the mold of a lunatic, as he quietly went about his work. It was difficult finding lunatic qualities in his predictable actions. Rivals often used his lack of intelligence to goad him in to unwinnable situations. We never understood the gimmick, and I don’t think he did either. He was a lunatic in name only, so management had something to put on merchandise. On Stone Cold’s podcast .. he ripped Ambrose so hard I thought he was gonna’ leap out of his chair and stunner his guest. Dean was so laid back for a guy being verbally torn apart by a legend. It should’ve been a wake up call, not just to Dean .. but to WWE officials to throw his character in a blender and come up with something better. As WWE Champion you’d expect more passion. The video’s edited for dramatic effect. The rest is history. He won titles as a babyface, but never got over in the way his Shield brothers did. One-sided, forgettable bouts with the likes of Triple H & Brock Lesnar didn’t help his status. A change of (Bane) image after a near-death experience wasn’t enough either. In the script, he was to be booed out of buildings for turning on Seth .. but it was so poorly executed it didn’t happen. We’d seen it before, only better .. when Rollins sold them out to The Authority. Again, Dean has nothing to sink his teeth into. He probably grew up dreaming of emulating characters like Pillman, and Piper, but with the state of main roster booking .. he hid in a bubble. Not sure if it’s just me, but it felt like his work deteriorated year on year. Remember when they tried getting the “Asylum” concept over? Better yet, remember when The Miz claimed Ambrose was a detriment to the prestige of the Intercontinental title? Is it Dean’s fault he’s booked as an afterthought? After plugging away for years, hoping WWE would come up with something fresh .. they failed to satisfy Ambrose when money’s no longer a key motivator. Because of this, it’s possible we may never see a reunion of The Shield. It’s possible he could decide to stay away for the rest of his career. It’ll be interesting to see where he ends up, and what he does when he gets there. I think he’ll only be satisfied if he can have fun portraying a character with more dimension. He might want to learn how to enjoy pro wrestling again, after eight long years in the WWE system. And as it’s been announced amicably, I imagine the door is open if his return to professional wrestling doesn’t turn out too well. May not be good news to some, but you can always hold on and hope that one day the Hounds of Justice will be together again. Crazier things have happened. Hideo Itami is the same, except he didn’t enjoy the same success. CM Punk, Daniel Bryan, and AJ Lee looked up to him like a mentor. Hulk Hogan showing up for his contract signing was enough to tell us how big of a deal it was. He was destined for a run with the NXT Championship, but serious injuries sidelined him for long periods, handing guys like Shinsuke Nakamura & Samoa Joe opportunities. I’d say the writing was on the wall when he debuted on 205 Live. It felt insulting to his career to be relegated to a division with so little importance. Kenta is a prime example of WWE signing talents with no long-term plan on how they can be used. They made a plethora of signings while he was out, so he didn’t stand a chance after getting lost in the shuffle. His demands of “respect” felt like a cry for help, it was easy to see how frustrated he was. I could only feel sorrow, as he gained losses in every match he needed to further his career. The announcement of his release felt like a weight being lifted. I wish him the best in his return to professional wrestling, where I know he will get as much respect as he demands. Who else could see the latest departures as an encouraging factor in taking a leap of faith? Is it bad to speculate who could follow in their footsteps? There’s no evidence they are looking to be released, but I wouldn’t be surprised if they pop up in news feeds in 2019. Please be aware, I’m not listing them because I want to see them gone, but because I think it’s logical at this point in their careers if they want it. Even more so if AEW come knocking with a fat contract filled with promises of health insurance and other goodies. Dolph Ziggler: Had a few mentions while discussing Dean’s departure. Remember when he was a “Show Off”? How did he do that again? I dunno. Also, remember when he had no entrance music? WWE has played around with ideas for Dolph, but he’s not been the same since splitting with Big E & AJ Lee. The Money In The Bank cash in is the biggest moment he’s never likely to replicate. He’s always around in some capacity, whether it be a typical mid-carder or flirting with the idea of being a main event star. I’ve always hated the name, and I still don’t get what, or who he’s meant to be. He’s Ziggler .. that’s it. Zigglypuff as AJ Lee calls him. Fifteen years in WWE, and all we’ve learned is he’s formerly of The Spirit Squad, and he likes to show off? It’s not like he needs money .. so he could call it a day anytime he wants. Do you think he should link arms with Ambrose on the road to better horizons? Some will say yes, but I’m not so sure. WWE needs to keep him motivated, or they’re going to lose one of their hardest workers. It’s difficult though, to imagine him being anything more than he is in WWE, and if he’s content in staying it’s fine with me. Yet, I know many would love to see what Nick Nemeth’s capable of in a pro wrestling environment. Do you think he could be a draw for other promotions? Or would he end up a disappearing act like Damien Sandow, or Mr. Kennedy? So frustrated for him. It seems WWE has done everything in their power to sabotage him. They got rid of “classic” Lana .. you know, the manager type that worked. They destroyed his gimmick by turning him “Russian”. And then what? He started claiming it was Rusev Day everyday. It was dumb at first, yet it caught on somehow. WWE didn’t like it getting over as he was meant to be a heel .. so they buried it. They split Lana away from Rusev and replaced her with Aiden English. They made Lana wrestle .. and Steve Austin was understandably critical of her getting a title shot against Naomi. Also, Lana magically lost her accent overnight. And now what? He’s working pre-shows with Nakamura? He can’t beat R-Truth for the US title? What is going on? What does he have to do to be taken seriously? It’s puzzling. Either he’s incredibly annoying backstage, or Vince enjoys making fun of him. It’s gotta’ be one or the other. Any other promotion would love to have him. How much more crap is he willing to take before he takes Rusev Day somewhere it can be celebrated? The least likely, but I think it’s closer to happening than you think. 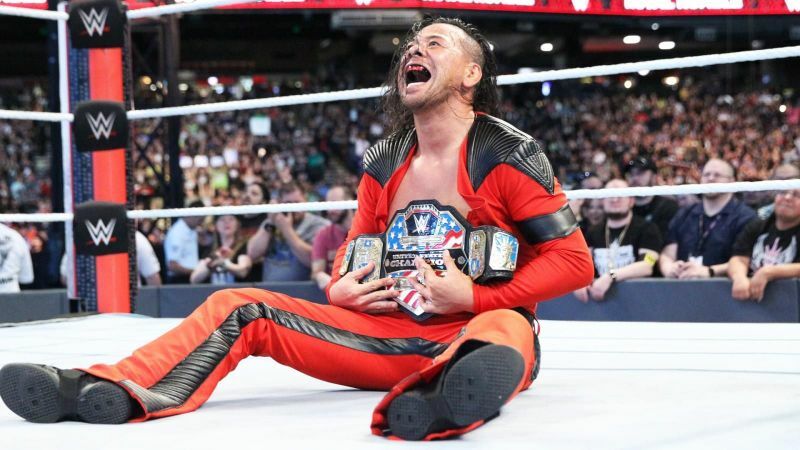 The problem after getting promoted from NXT, was WWE’s failure to sufficiently explain to the casual WWE Universe who Shinsuke Nakamura is. They built him up in NXT, although they didn’t need to as (wrestling) fans already knew who he was. But when Shinsuke got to the main roster, he desperately needed WWE to spend time selling his character. They needed to explain why he was a star in Japan, and create a connection between him and those who didn’t get his deal. But what happened?? The fans loved his entrance music instead; so he gained a condition known as “Fandango syndrome”. They didn’t get him as a character, but they loved his entrance. WWE expected his promos to do the work for them, but it wasn’t enough to get him over. After winning the Royal Rumble and challenging AJ Styles at Wrestlemania, they still didn’t do enough. They catered a little to the wrestling fans on the website. They had scrapbooks explaining AJ & Nakamura’s match at New Japan’s Wrestle Kingdom. I knew who he was, but I could see how someone new to the “Rock Star” could have a difficult time comprehending. How is this Japanese guy who moves like he’s having a seizure a big deal?? The casual audience couldn’t figure it out so they resisted, while those who got him sighed at their naivety. If Shinsuke does feel dejected (look where he is ..), he could easily contact New Japan for a return. He could contact AEW too, for a sweet deal. When you think about his mindset though, I assume he’s not one for giving up. He’ll persevere til he wins the WWE Championship. That’s his goal, and he might feel returning to New Japan as a sign of failure. He wants to prove it is possible to crossover from Japanese star to WWE star. Asuka’s jumped ahead of him, but even she had to endure a down period after losing the streak. Is that all it is for Nakamura? Is WWE merely keeping him busy til its time for a real push, like his past greatness tells us he deserves? Or is he going the same way as Itami? His career is hard to contemplate. The character has had an incredible amount of time & freedom to progress, yet it doesn’t feel like it has much. He never makes sense as a face, and being alone as a heel doesn’t cut it either. Wyatt as a cult leader of monsters? That’s what he’s best at. Why did they stop that? Unlike The Undertaker, his character never had the kind of moments which lodge firmly in the fans minds. It’s not like he can hang his opponents from a Hell in a Cell. He’s not making coffins in a workshop for his opponent to be buried in. Certainly can’t tie Steve Austin up like Jesus on a cross. He never had the breakout moments, and it’s hard to hear what he’s talking about half the time. I guess .. he has the neat trick of magically showing giant maggots crawling on the ring mat? And he can walk like a spider? Great. I can barely remember his explanation for Sister Abigail. They tried furthering his character in the feud with Randy Orton, but it was so cringing I’d rather not say more. The moments he’s had, have not been as beneficial as they needed to be. As a former WWE Champion, it’s not like he has any goals to aim for. While Dusty Rhodes saw potential in the character, it feels out-of-place for what WWE has become. How do you make this character intimidating, scary, creepy, or any other dark quality on PG TV? Could he decide to hang up the lantern for good? Is he tired of being Bray Wyatt? I think it’s telling that .. when “Woken” Matt Hardy got injured, WWE had literally nothing for him. He’s not injured .. yet hasn’t worked a match since Starrcade in November. What does that tell you? He’s either on the way out, or his character is undergoing a makeover. Or there’s something bad going on in his life? Whatever’s happening, something has to give as it relates to The Eater Of Worlds. There was talk of The Revival asking for their releases. Could it have been a threat? Was it so WWE would reconsider how they are used? We have seen ’em used more since it was reported. We’ve also seen guys like Zack Ryder getting airtime. It’s a delicate situation, as WWE is being forced to use talent or face the risk of losing them. Options are opening up, which is making the landscape change rapidly. 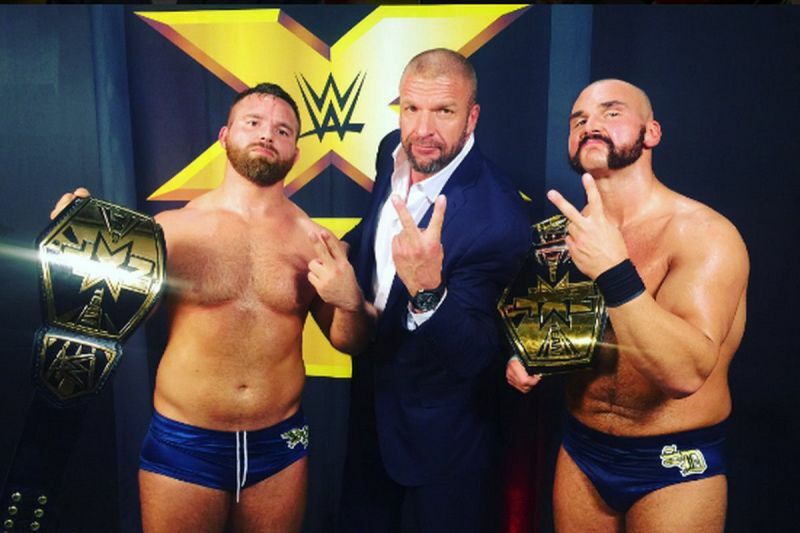 I believe The Revival will stay if WWE uses them, with promises they’ll get a tag team title run down the line. But if they don’t get what they want? Expect them to go the same way as Ambrose. They don’t want to be considered afterthoughts. I’m already intrigued by 2019. There’s so much that could happen from now til December. The landscape could look completely different by Xmas. Who do you think could follow Dean Ambrose & Hideo Itami? Who do you think would flourish in AEW? Is it possible we’ll see talents looking to go elsewhere? Like New Japan? ROH? Impact? Does it have to be about AEW money? It’s an option, but not the only one. Do you have any answers to my questions? I’d like to read your thoughts in the comments section. Thanks guys! You know I appreciate everyone who follows my work. Always a pleasure.